Pope: "Here the paths of the world's three great monotheistic religions meet"
JERUSALEM (CNN) -- Pope Benedict XVI visited Jerusalem's holiest sites Tuesday, touring areas sacred to Muslims, Jews and Christians and stressing the common threads of the three faiths. 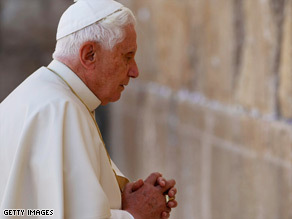 Pope Benedict XVI prays at the Old City's Western Wall, also known as the Wailing Wall. After visiting the Dome of the Rock, an Islamic shrine, the pontiff prayed at the Old City's Western Wall. Also known as the Wailing Wall, it was once part of Judaism's Second Temple, which was destroyed. Later, the pope was scheduled to celebrate Mass at Gethsemane, the site where the Bible says Jesus prayed to God for guidance the night before his crucifixion. "The Dome of the Rock draws our hearts and minds to reflect upon the mystery of creation and the faith of Abraham. Here the paths of the world's three great monotheistic religions meet, reminding us what they share in common," the pope said at the Islamic shrine after a meeting with the grand mufti of Jerusalem, the city's top Muslim religious leader. "Each believes in one God, creator and ruler of all. Each recognizes Abraham as a forefather, a man of faith upon whom God bestowed a special blessing," the pontiff said. Muslims believe that the Dome of the Rock is where the Prophet Muhammad ascended to heaven, while Jews believe that it is where Abraham prepared to sacrifice Isaac. A short distance away in the Old City is the Church of the Holy Sepulcher, believed to be located on the site where Jesus was crucified and buried. The visit took place under extremely tight security. Security personnel with machine guns could be seen across the Temple Mount.